Relocatable Manufactured Homes Nigeria - Transportable Prefab Houses And Cabins. 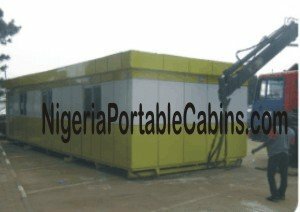 Relocatable Manufactured Homes Nigeria - Benefits of Transportable Prefab Houses And Cabins. Relocatable manufactured homes have come to stay in Nigeria Africa. This category of prefab houses provide immense benefits to their owners because it provides the much needed solution to the major headache associated with traditional sand and cement houses. Relocatable manufactured homes are especially beneficial to organizations that are constantly on the move like construction companies who have to move from one construction site to another as they complete one project and start another. However, do not jump to the conclusion that relocatable prefab houses are only for construction companies and people who use mobile offices. It's because every now and then, we hear regular people say, "I wish I can move my house!" If these regular folks had understood the value of relocatable manufactured homes (and bought one) in the first place, they would not now be looking back with regret. Perhaps there have been times when you wished you could shift your house a couple of metres to the left, to the right, backwards, or forwards. But that will remain only a wish if your house is not a relocatable prefab house. The limitation posed by a non-relocatable block building can be very expensive especially in instances where the government require home owners to shift their buildings a couple of metres back to allow for road expansion or laying of utilities pipes or cables. In fact, many property owners in Lagos Nigeria (and other key cities in Nigeria) have lost their high-earning strategically located properties to government road expansion work because the houses could not be relocated in one piece. Relocatable manufactured homes have huge benefits! And we highly recommend that you take advantage of relocatable prefab houses whenever possible. You may wonder, "how can a house be relocatable?" Relocatable prefab houses are usually built on steel foundations. This means that you can carry the house along with its foundation to wherever you wish to move the house to. You may have also heard us speak about transportable prefab houses or transportable manufactured homes. What is the difference? Basically, there is no difference. A relocatable house is usually also a transportable house. You see, a manufactured house can be relocated from one position to another position within the same premises or relocated to another city altogether. As mentioned above, relocatable prefab homes are built on steel foundation and therefore can be relocated (along with the foundation or base) within the same premises or to another town or city altogether. Consequently, if there is ever a reason to move your house . . . either within the same premises or off to a different part of the city (or even to a different city) . . . you will have no reason to regret if your house is a relocatable portable cabin or prefab cabin. Buy a transportable manufactured house today. You will be glad you did.